Recorded live on June 29, 2008 at the Counter Action - in Sapporo, Japan. CD art work done by Tobi Kaori. Pretty much your typical live Acid Mothers Temple concert performance. 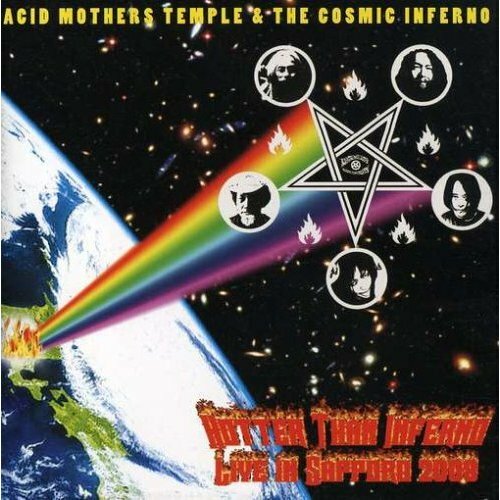 This 73 minute disc has two tracks - the noisy tripped out "Master Of The Cosmic Inferno" (26:30) in which after about twelve head-spinning minutes, the more space rock-like somewhat-hypnotic "Heart Of Earth" takes over. Features Pikachu (according to the CD's liner notes) providing some hot female vocals. Sounds great. Next up is "Pink Lady Lemonade" (45:50) with bassist Tabata Mitsuru on vocals, then after twenty minutes, we hear "Doobie Wonder Land" (you have to love that song title) that employs some whirlwind electronics with Kawabata Makoto's trademark R-I-P-P-I-N-G guitar work. Then 'Live In Sapporo' comes to a close, they play a "Pink Lady Lemonade" reprise. Well done. I've seen AMT play live - twice now and I wanted to mention their usual gigs consist of three actual songs, lasting about fifteen minutes each, then (depending on how much time they have until curfew) the second an maybe third song leads right into another tune out of their (seemingly) endless repertoire. As 'Live In Sapporo' may not be for the Acid Mothers novice, it's every bit as out-standing as the Acid Mothers Gong - 'Live In Nagoya' - also on the Vivo label. Get it now, before it becomes out-of-print.